For an updated version of this softbox that is fully compatible with the RFi Speedring, please see the Profoto RFi 4 x 6 Softbox. The Profoto 4 x 6' Softbox connects to a speedring (not included) via included rods and the pair are then connected to a flash/strobe for light shaping. The silver interior provides contrast while the double layer diffuser and removable baffle keep your lighting soft. 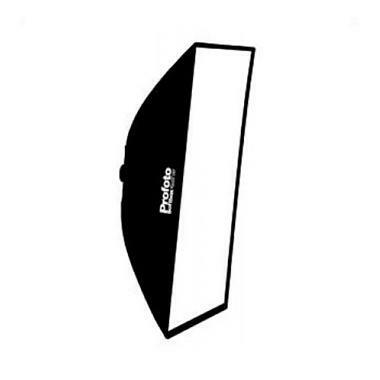 This 4 x 6' rectangular softbox is ideal for creating a wall of light, either as a glowing backdrop, lighting larger groups, or creating very soft light for one person. • For an updated version of this softbox that is fully compatible with the RFi Speedring, please see the Profoto RFi 4 x 6 Softbox.